TORONTO, ON – Left Field Brewery has announced the return of a strong winter seasonal in both regular and barrel-aged versions. This beer pours black and opaque with a mocha foam, giving aromas of baker’s chocolate, vanilla and plum. Blackburne is viscous and smooth, saturated with decadent fudge and toffee, and laced with evergreen bitterness that gives way to a warming finish. 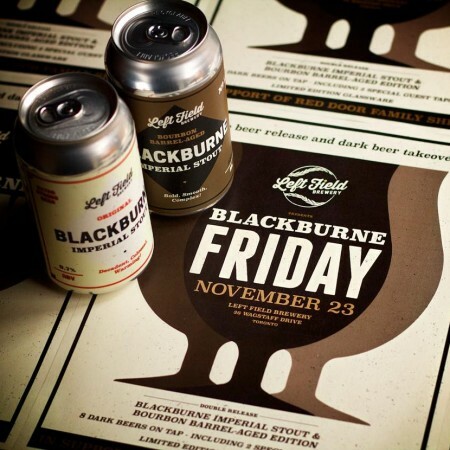 This year’s batch of Blackburne will be released along with the new Bourbon Barrel-Aged Blackburne Imperial Stout this Friday November 23rd during a special Blackburne Friday event at Left Field. In addition to both versions of Blackburne being available in 355 ml cans and on draught, there will be six other dark beers on tap – including two special guest taps – along with food by Sausage Party, limited edition glassware, and fundraising for Red Door Family Shelter.